For those that want to know about new features, it doesn't look like there's anything to talk about right now. Quite a few of you are probably travelling back home this weekend, and if you'd like some free or low-cost tunes to get you there, check out the Google Play Store. Play Music has four albums available for free, and another eight for just a dollar each, all from popular musicians and most of which have been released just this year. As usual, your mileage may vary with this deal - these album prices are valid in the United States, but may not be available elsewhere. 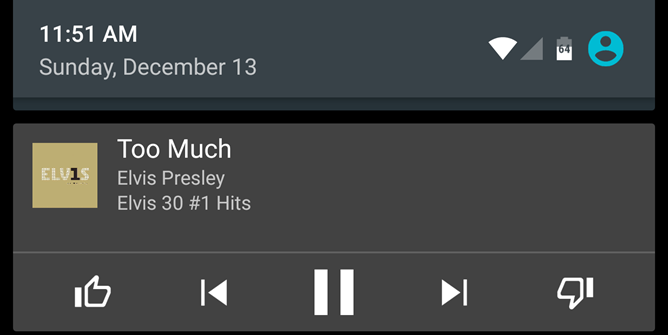 Google Play's branded Music app has had Pandora-style thumbs up and thumbs down controls, applicable to your local and cloud music as well as streaming radio stations, for quite a while. But they're not all that easy to get to: aside from the "now playing" screen and the homescreen widget, the functionality isn't all that obvious. The latest update to the app puts those recommendation tools front and center, right on the notification and lockscreen controls. We're actually looking at two Google Play Music updates here: version 6.2.2220U.2476962 and the slightly newer 6.2.2221U.2480853. Both of them are nearly identical with one notable exception. It's official. 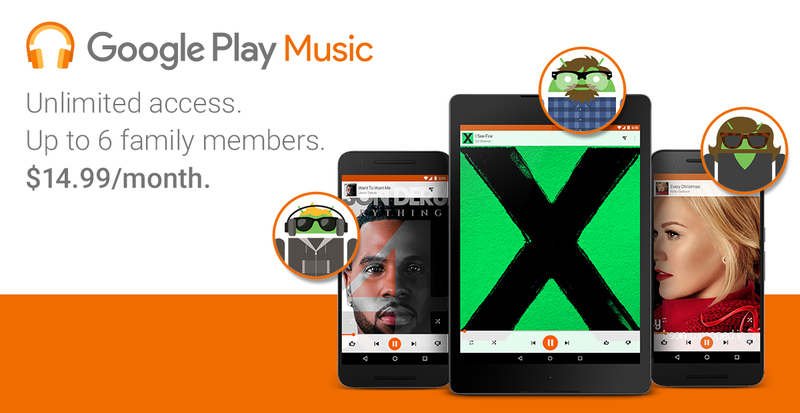 Google has announced that Play Music family plans are arriving in the coming days in Australia, Canada, France, Germany, the UK, and the US. They will let account holders share music with up to five other family members for a cost of $15 a month. Canada and the US may be neighbors, but that northern border is quite a ways away from most of the contiguous 48 states. It takes a bit of time to drive up from a place like California, and as we know, all Google services must make the trip from San Francisco. Well after nearly half a year of driving, the ad-supported version of Google Play Music has finished the trip to Canada. With all of the activity surrounding YouTube Red, including a brand new YouTube Music app, it seems like a good time for a Play Music update. Version 6.1 just landed and aside from a mysterious new "Auto-offline" feature and a bit of cleanup in the Settings screen, it looks like a pretty typical bug fix release. However, the teardown tells a different story. It looks like this version also brings support for the recently announced family plans and Android Wear speaker support. As usual, we've also got a download link at the bottom if you can't wait for the apk to roll out to your account.